At first bite, this colorful new cereal tastes remarkably similar to Froot Loops. It takes a few spoonfuls before you start to notice and probably appreciate that there's still a touch of good old original Cheerios flavor in the new version. It may be a poor choice of words, but this cereal is sophisticated when compared to the likes of Froot Loops and Fruity Pebbles. The fruit flavor might seem to come from the same bottle as those cereals, but Fruity Cheerios lets through just enough oat and corn taste to set it apart from the crowd. Fruity Cheerios has a bit less sugar than the other cereals mentioned and it retains the American Heart Association approval label that's on the original Cheerios box. For my money, the only reason to choose another fruity cereal over this one would be their ability to color and flavor the milk, a fun bonus that this cereal lacks. What do you think of Fruity Cheerios? I always loved Fruity Cheerios and the daycare kids but a few months ago I bought a box, thought the coloring on the box was different. Thank God I had a bowl before the kids. It was nasty, tasted like pepper. Went back to several stores and they changed it to gluten. I am sorry but not everyone can eat gluten. We will go back to Fruit Loops. Don't like pepper in my cereal. The aftertaste is really bad... might as well eat clay. Tired of eating granola-y cereal every day, but not wanting to buy a box of sugary crap, I found these at the store. I must say, I could not be happier. I have always been a fan of Froot Loops, Trix, etc., but these are so much better! The flavor is more truly fruity, and they don't go soft in the milk to nearly the degree that Froot Loops do. I highly recommend them to anybody and everybody. These taste exactly like Froot Loops to me, just not as dense. I'd prefer them over Froot Loops to be honest, as they're a little better for you! These are really good, now that I finally like them they are nowhere to be found here in Canada, just like frosted cheerios and a whole slew of cereals the US do carry. I guess I'll have to settle for fruit loops which I haven't had for years. I loved them. Whole grain goodness and colorful too. This cereal tastes just like Trix! 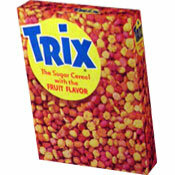 I loved that cereal as a kid but Trix was taken away! :( The rare time I see this on the market I grab them- I love the Trix / Fruity Cheerios taste! 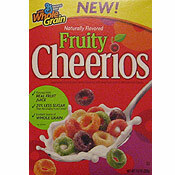 Fruity Cheerios tastes fruitier than Kaboom (without the marshmallows) but less fruity than Fruit Loops. I love Kaboom & since it's becoming harder & harder to find, I suggest buying a box of Fruity Cheerios & a box of Lucky Charms & taking some marshmallows out of the Lucky Charms (there's more than enough of those in there) & mixing the marshmallows with some Fruity Cheerios to make a mutant Kaboom. I couldn't help but compare it to Fruit Loops. It does taste great and I appreciate the texture of this cereal more than Fruit Loops but I still like the taste of Fruit Loops more than this fruit Cheerios. I would also rather my milk turn a different color and taste a little bit sweeter but it doesn't do that! I like it and I'll eat the whole box but I wouldn't buy another box. Frikken amazing... I couldn't get over the strange bubbly milk it makes.... and the girl who saw the spots on her Cheerios was on acid.... these are great. It's fruity, it's crunchy, there's no aftertaste, sweet but not sugary, and it's good for you... makes it a winner in my book. I think this stuff ROCKS OUT LOUD!!!! I would have figured this cereal to have less sugar than it did, i was fooled by the cheerios name, they do taste good though, i haven't had a bowl of fruit loops in a decade because they are so horrible for you, thought these would be better. They taste delicious. I need a recipe using Fruity Cheerios! Doesn't taste like fruit loops, more like trix. I love the taste and especially how small the O's are. My new favorite cereal. OMFG SO GOOD, you are all nuts. This cereal is revolutionary! I didn't personally taste this cereal because fruity cereals/sugary cereals are not my thing. But my husband (who LOVES Fruit Loops!) and my 2 teenage boys (who also, of course, like Fruit Loops) thought it tasted awful! I have tried to get them to explain exactly why they don't like it but they don't seem to be able to explain (it seems they are making too many gagging sounds and other unpleasant noises to verbalize). I thought this would be a great alternative to FL--less sugar and more REAL food. And Cheerios for crying out loud! But I was very surprised to hear them groaning over it. Funny how people's tastes can be so different. I was eating a bowl and noticed black or very dark purplish brown splotches all over some of the o's. I don't know if it is food colouring for the purple ones that were spread onto the other coloured o's but it scared me as I am 5 months pregnant and don't know what I have injested. I am calling the info number on the box tomorrow as I am worried. I am hoping it is just food colouring. Let me just say that fruity Cheerios are awesome! They have a lighter less sugar taste than fruit loops but the fruit taste is actually stronger and smoother and not as masked by sugar. You can actually tell they used some real fruit flavours in making this product. Let me also say that Maymayelle, rosebello, bb, Yesdinl and EatRight don't know wtf they are talking about. Retards trust me. You will love this serial if you are not a obese sugar junkie that dislikes natural fruit. Best cereal I've ever eaten - bar none! Highly recommend them from someone who enjoys a spectrum of both healthy cereals (e.g., Special K, Total) as well as the sweeter favorites (e.g., cap''n crunch). A good middle-of-the-road alternative - good for both adults and kids! This cereal is AWESOME. It tastes like Trix but with you can tell it''s nothing more than Cheerios with a fruit taste. It definitely makes me not want to add sugar to my cereal anymore. If youre expecting a Fruit Loops taste, you will be disappointed. These taste a bit lighter. They are good, but not as good as Fruit Loops. Much better than fruit loops, and my family trusts the name. All those out there who dont love this cereal are crazy!!! It is so much better than those obese kid loving sugar-loaded crap, my sister and I would choose it over Fruit Loops any day! All you people hating on Fruity Cheerios are OUT of your noggins!! They taste soooo much better than Fruit Loops! In a world where having a healthy BMI is no longer the norm, I would hope that Fruity Cheerios would be embraced for their healthy approach, rather than be discouraged because they don't satisfy your obese sweet teeth!!! UMMMM.... O.K. hasn't Cheerio's ever heard of... let's see... Kellogg's Fruit Loops??? Not quite as good as the sugar-loaded Froot Loops, but pretty darn good! Just got these for the first time and we love them. I keep three kinds of cereal in the pantry, bit size shredded wheat, Corn Flakes, and now this. It's a great alternative when we want something sweeter, and it's healthier than most any of the other sweet alternatives. Yech, why would anyone feed this crap to thier kids? Fruity Cherios are terrible! I still have a box 1/2 full of them in my cabinet. I cannot stand them, although I suppose they are much healtier than Fruit Loops. Well, some people could use less sugar. I strongly suggest you don't buy them, but that's my opinion. I had picked up a box of the 25% less sugar Fruit Loops, and a box of these, and my 2 year old daughter preferred these over the Fruit Loops! And I do, as well! So tasty! Fruit loops taste a lot better. Fruity Cheerios has an extraodinarily cheerful fruity flavor combined with the great crunchy texture of cheerios--and it doesn't go soft in the milk! Fruity Cheerios is far superior of the 'other' fruity cereals. This cereal is fun to eat and while fruity, still retains that famous "wholesome" Cheerios flavor. Definitely worth trying if you're a fan of fruity cereal. You are totally right. I almost made my wife take them back to the store, since they looked like sugary goop. But lo and behold, they didn't seem to have nearly the sugar content of Froot Loops. (And they don't--25% less, sez the box.) Kids 'n' parents have a new favorite!